Alma Mendenhall has helped Raymond and area residents raise funds for the Raymond Health Centre for five decades. Alma celebrates 50 years of volunteering with the Raymond Auxiliary to Health Care Facilities. 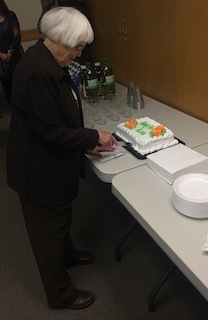 Raymond Volunteer Resources recognized her outstanding contributions to the community on Jan. 16 at the Raymond Health Centre. Alma added the community has supported the health centre’s auxiliary 100 per cent over the years. “200 per cent, really,” she joked. The auxiliary helps with fundraising for various items the health centre has purchased including a birthing tub, bladder scanner, cardiac defibrillator, a lab analyzer, and so much more. In the 1960s, the auxiliary gave $25 to Alma’s daughter — who had decided to pursue a nursing career. To thank them, Alma made donuts for one of the organization’s fundraisers, according to a recent media release. “That donut recipe — evolving over the years with help of her friends and fellow volunteers — is now considered a major part of the auxiliary’s fundraising efforts, which brings in thousands of dollars every year for health care in the community,” it was stated in the media release. Now, the donuts are made for the fundraiser at the Cultural Hall in Raymond. “They let us use their kitchen,” she said. When Alma first started volunteering for the auxiliary and with the bake sale, she said the fundraiser raised $400 — now, the bake sale fundraiser raises thousands of dollars. Alma, according to the media release, has stayed involved every step of the way — helping to make thousands of donuts, even with her 95th birthday not too far away on Feb. 2, which is also Groundhog Day. “I’m humbled. I never dreamed of anything like this,” she said, with receiving recognition from her family and friends for her volunteer service. “She’s the type of person that doesn’t like to be out in the public eye. She works in the background. That’s why a lot of people don’t realize the amount of work she puts into the hospital auxiliary, but she does an amazing amount of work for us,” he added.